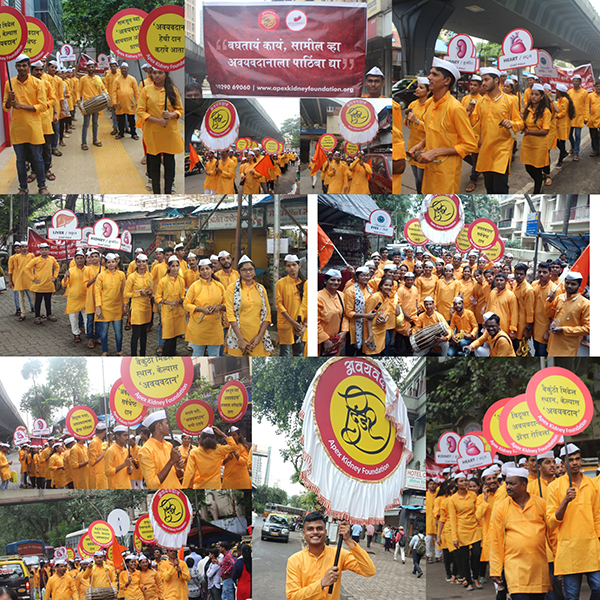 Apex Kidney Foundation has organised “Aavayav Dan Dindi” from Lalbaugcha Raja Dialysis Centre to Wadala Vitthal Mandir on Monday 23rd July 2018. Making people aware about Organ Donation is the need of the hour. We aim to increase public awareness about this noble cause. * 40 volunteers from Apex Kidney Foundation participated in the dindi. They distributed organ donation<http://www.mymedicalmantra.com/glossary/organ-donation/> pledge forms and made people aware about the concept of organ donation<http://www.mymedicalmantra.com/glossary/organ-donation/> through placards and banners. * On this auspicious day, volunteers came together to celebrate this day and also enjoyed the event. We spread awareness and clear misconceptions related to organ donation<http://www.mymedicalmantra.com/glossary/organ-donation/> in this dindi. * The day, when we declared our event on facebook, one group who is also doing the awareness about organ donation, showed interest in joining our dindi. We invited them to join on the spot. * We had permission from the authorities for 40-45 people. * We got a huge response from people of this area. Common peoples who are traveling around this area captured photos and videos of the dindi. We encouraged them to share these on social media. * Also we got appreciation from another group who were promoting for social cause named Vruksh Dindi. Some Social Service League High School were also interested. * We also got very good support from the Bhoiwada Police Station. They appreciated our innovative idea. * ROTTO co-ordinator Ms. Sujata Ashtekar also appreciated this idea and the way we executed this event. * Renowned Marathi media My Medical Mantra, Sakal and Tarun Bharat had covered the event. This Event conducted under supervision of Dr. Vaishali Bichu, Mr. Kunal Shinde, Mr. Nilesh Shedge, Ms. Ranjita Parab, Mr. Kahnu Pradhan.